FILE - NORAD and U.S. Northern Command Chief of Staff Maj. Gen. Charles Luckey joins other volunteers taking phone calls from children around the world asking where Santa is, at Peterson Air Force Base, Colo., Dec. 24, 2014. His arrival is perhaps the most anticipated moment of the year for many children. It comes on a glorious night when nine reindeer zoom into the sky at the North Pole and carry his sleigh full of toys around the globe, stopping at house after house where he descends down the chimney with a gift for ever good little boy and girl inside. The anticipation of an entire year builds after nightfall. Parents urge kids to go to bed and let visions of sugarplums dance in their heads, lest he arrive to find them awake and dash away to the next house without stopping. But the children cannot get the question of the night out of their minds: When will Santa Claus get here? That is where the North American Aerospace Defense Command, or NORAD, comes in. The personnel at Peterson Air Force base in Colorado are answering phone calls from kids across the world with the latest information on Santa’s location on his journey and an estimate of when he will arrive in their town. Some kids will have their call answered by a special guest, First Lady Michelle Obama, who volunteers every year as part of NORAD’s Santa Tracker. The program is in its 60th year, and in addition to serving kids by phone it includes a website that shows Santa’s location along with constantly updating statistics about his trip. There is also a Twitter account and Facebook page, as well as apps for Windows, Android and Apple mobile devices that have the same tracking information and games found on the website. The apps can be set to eight different languages: English, Spanish, Dutch, French, Italian, Portuguese and Chinese. NORAD’s mission to scan the skies above North America makes it an obvious fit for the task of tracking Santa, but the entire enterprise began by accident. 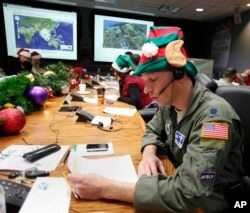 FILE - Air Force Lt. Col. David Hanson, of Chicago, takes a phone call from a child in Florida at the Santa Tracking Operations Center at Peterson Air Force Base near Colorado Springs, Colo., Dec. 24, 2014. In 1955, the Sears Roebuck & Co. department store placed an ad in a Colorado Springs newspaper with a phone number for kids to call and speak to Santa. But the number was incorrect, and instead went to a phone inside NORAD’s predecessor agency, the Continental Air Defense Command. Fortunately for the kids, the staff working that Christmas leapt into action and put their radar equipment to work keeping tabs on the jolly man in the big red suit. There were 2.8 billion people in the world in 1955, and now there are more than two and a half times that number. That gives Santa, and his trackers, a big challenge for their one-day mission that will come down to the last second before they return home and get ready for the next Christmas.